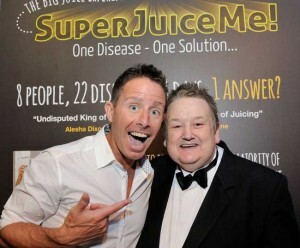 If you’re familiar with Juicing then you will have heard of Jason Vale aka The Juice Master. If you are not familiar with juicing…then you are MISSING a trick in life. No one can learn to ride a bike on their first attempt, or drive a car on their first attempt. Likelihood is, no one will like, manage, or become a raving fan of juicing on their first attempt. But like everything else I teach about improving your health…it’s all in the patience and persistence. Repeatability leads to success and mastery. I know plenty of people who are experiencing serious health problems, largely brought about by not looking after their health as they aged. I know plenty more people who are having to care for such people, and I know how draining and mentally challenging this can be. Juicing is just one item of a large toolkit of healthy actions you can begin in middle life, to make later life healthier and happier, not just for you, but for the ones who love you. The film Super Juice Me shows the story of 8 people who are struggling with their health and happiness in life. I highly recommend everyone watch it. It only costs a few pounds to hire online, a few more pounds to purchase the DVD…and even some weekends there are free viewings. I encourage you to watch and share…it might just change someone’s life for the better…maybe even yours ! For access visit Super Juice Me.